In Albania began today the new school year and 480 thousand students are ready to face the new year. The education ministry stated that the curricula are more easy for the students, far from old methods. 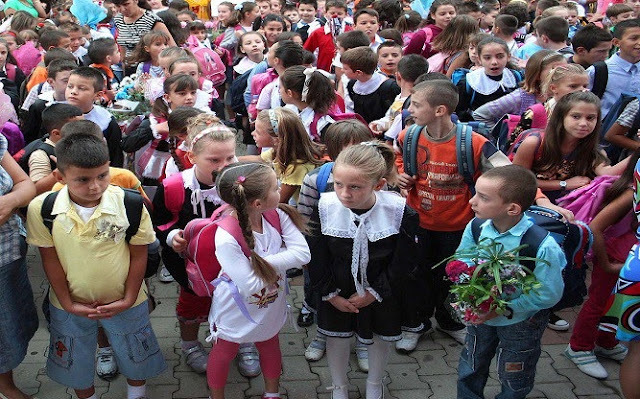 Approximately 32,000 children go to school for the first time, while 39,000 high school students will experience a new maturity, which, according to the ministry, is linked to the University and the labor market. This school year the Ministry distributed free books from the first to the fourth class for approximately 190,000 children, while students from grade 5 in grade 12 will continue to pay for textbooks. But the Coalition for Education stated today that Albania remains among the last countries in the region and Europe to finance education. According to him, the government promises to raise the education budget by up to 5 per cent of GDP for 6 years, but the state budget for education is only 3 per cent. This lack of investment in the education of children and young people, places Albania among the last countries in Europe for the results and achievements of students compared to the OECD countries. The lack of public investment in education and the scarce Government spending on quality and education continue to leave behind the education to a small proportion of children and adolescents, the Coalition for Education said. According to the World Health Organization, nearly half of the schools have no drinking water and about 70 percent of them do not have adequate hygiene conditions for child education, the Coalition quoted. Almost 64% of children with disabilities remain out of the pre-university education system and only 35% of schools in Albania are accessible to these children, the Coalition said. The Coalition for Education added that education of Roma and Egyptian children remains a problem, while 38.6% of Roma and Egyptian children do not attend compulsory education. One of the main problems of education remains violence at school: nearly 40% of students are victims of physical and psychological violence, while 22 percent of them feel threatened by teachers. Almost 20 percent of students are bullying victims, while 50 percent of students are witnessing discrimination of students in their school, the Coalition for Education said.